According to art historians, the true motive that prompted Borisov-Musatov to go to Paris was his desire to get new artistic impressions. At the same time, while studying painting in Cormon’s studio, the artist with special diligence absorbed everything that had to do with the new trends in the fine arts. During the three-year training period, Musatov returned to his native Saratov every summer, but his vacation was limited to standing at the easel. In 1897, during his regular visit to the small homeland, the artist wrote a series of sketches for his planned large-scale composition “Motherhood”, which remained unfinished. “Agave” – the name of one of the sketches of this colorful series, made in the Impressionist genre, in the spirit of the revered Pius de Chavannes. The world of symbolist painting is inextricably linked with the colors embodying the entrance to “other worlds,” and Musatov, a symbolist in spirit, constantly staying in the land of dreams, gave this exotic plant a particularly solemn appearance; the truth in this plot, agave, probably, the role of a hymn to nature, but powerful, and fantastically colorful, will be more suitable. 1897 Oil on canvas. The State Tretyakov Gallery, Moscow, Russia. 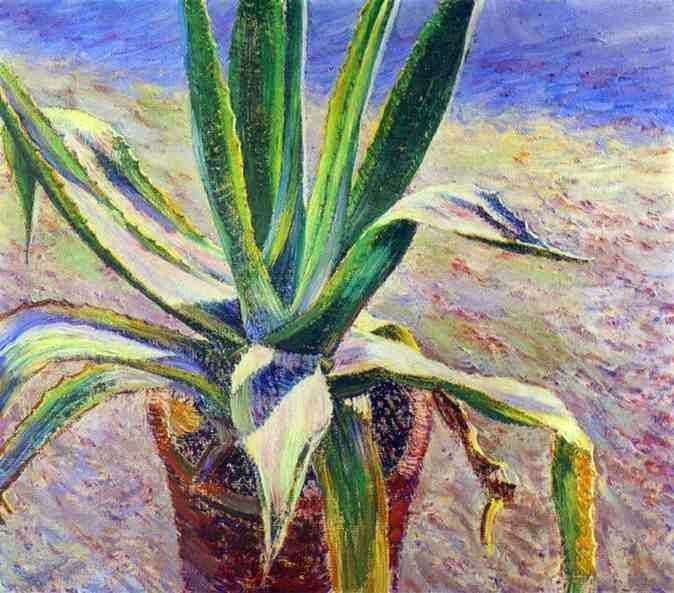 Description and meaning of the painting Agave by Victor Borisov-Musatov.